I honestly couldn’t think of another way to describe this pharmacy beyond the way it possessed an air of humdrum plainness. The storefront, like its neighbours in the row of shops crouching at a corner of Commonwealth Crescent, seemed so inconspicuous as to nearly melt into the wall behind it, peering out at the courtyard like a sleepy cat. I was drawn in not by any curious thing dangling above the storefront, but the twinkle of a pair of eyes from the shady recesses of the shop’s interior. My father had told me stories of how his family had run a pharmacy just like this in his youth, when his older sister would have to get up in the morning to grind antelope horns into powder to be dispensed over the counter. I wondered if they, too, had been like the pharmacy owners I saw that afternoon, going about their business with a quiet, slow deliberation while cocooned by the gloom inside the store from the proceedings of the outside world. 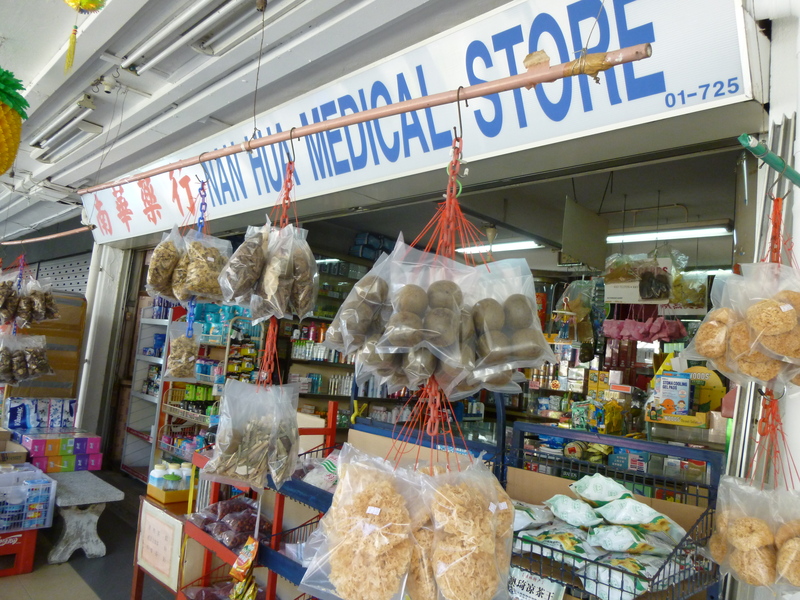 The place, like all Chinese pharmacies here, seemed equal parts apothecary and personal care store, with a faint odour of herbs hovering above shelves packed with bottles of shampoo next to boxes of cordyceps. I sat down next to a bespectacled man. He seemed intrigued that I was curious about an ordinary pharmacy. I was intrigued by the red dates he was grabbing in fistfuls and repackaging into smaller bags in a shallow woven basket. After some awkward attempts at talking to him in English we lapsed into Mandarin, talking softly almost as if we were afraid of breaking the stuffy silence that prevailed. “The shop has been around for 50 years. It was started by my father, and now my uncle and I work here. The shampoo products were always here, but we had to stock more of them because of a lack of business. We get customers, both old and young people. The area is a mature estate so it’s mostly the elderly who live here. I’ve lived here all my life, so I know the people around here. That woman who came in just now, I helped her top up her phone card. We stock animal parts whenever we can, but we don’t have a lot of them anymore because of the new laws. He moved on to packaging preserved plums, and offered me one. We both placed one in our mouths and sucked on it. “Didn’t your mother ever warn you about taking food from strangers?” he asked coyly. “But this tastes better than sour plums doesn’t it?” He opened one of the smaller bags and passed me another. We sat in momentary silence, sucking on our plums. Then, he looked over his spectacles at me with a twinkling gaze.